Patience: A Lesson In Joy: Sometimes, absurdity is the best medicine. Sometimes, absurdity is the best medicine. Enterprise wanted to charge us about $60, Thrifty (if you can call it that) wanted $80 for only ONE full day. 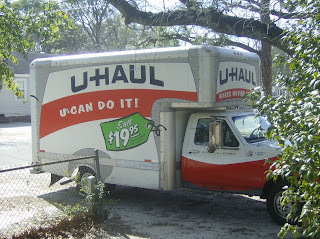 UHAUL, as you can clearly see, is $19.95 + mileage. I love that!! I don't know if I would have thought about that but I sure will next time!!! We are doing well, it's just been an extremly busy week. I had 40 hours in going into today! I don't know if I am coming or going!! Tell everyone hi for me!